Gboard is now testing a new feature that makes search smarter, offering users contextual content results based on what they type. 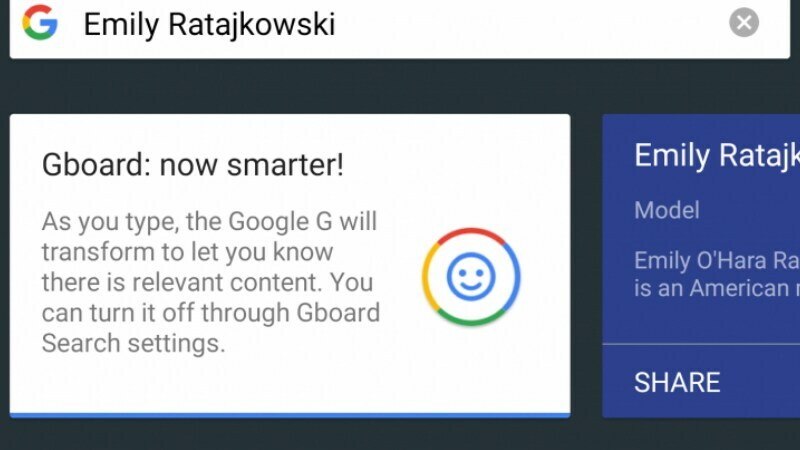 The 'G' logo that sits on the top left of Gboard app, transforms into different icons to let you know that there is other relevant content that you can use instead of the text you've just typed. You can turn this feature off in Gboard search settings, if you find it too intrusive. The testing of this feature is reported have started a long time ago, with traces going as far as July, but now the feature is being tested on more devices and has been refined as well. For now, reports of it showing up are coming from Android devices, though the feature can be expected to make its way to iOS devices at some point in the future. The report states that the 'G' logo will also transform into a search icon if you type in names of celebrities. The search icon gives out shareable info cards about the celebrity in question. Lastly, the GIF icon will appear if you type a keyword that will trigger it. For example, if you type 'heart GIF', then the 'G' logo will automatically transform into a GIF icon, tapping which will give you many heart GIF options. However, keywords like 'dog' and just 'heart' may also trigger the GIF icon. As mentioned, this feature can be turned off in Gboard Search settings. This feature is still in testing, and is still on the server-side of things, so even if you're on the latest beta you might not see it. Also, functionally, the smart search feature brings nothing new as such, as GIFs, search, and stickers were already a part of Gboard. This feature essentially prompts you proactively, letting you know that there is something relevant for you based on the text you have typed. There is no word on when it will roll out commercially for all users.